The scroll at the top of of the double bass barely fits in below the low-slung ceiling up front, and there's even less space at the back, with the doorman repeatedly explaining to eager beavers that there's no more room at the inn. The album launch of Anecdotes - Volume II at Kansas Smitty's was an Event, and less than two years since the Matthew Read Trio released their first record, this is strong evidence of their growing acclaim, and/or having lots of friends. 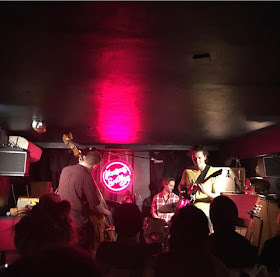 Arbour served as a frugal opener; an introduction to Read's measured bass, clean guitar washes, and a reminder of where the trio were musically in 2016. It was the follow-on to Many Roads Travelled that presented where they are now – a more serious, classic, integrated sound. Built around a clear hook and a ringing groove, each component contributes a texture, and rises and falls. We slide from Read's narrative bass style, and through flowing, multi-faceted rhythms from Arthur Newell on drums, mixing patterns and evidently enjoying the playful opportunity to develop beats throughout. In such a small space it can be hard to manage the mix between excitable drums, and soaring guitars, and the bass held it's own fantastically on the more controlled numbers. On the rockier romps, like S.E. and Su Doku 3810, it was easier to slip beneath the drums and guitar. But there were real moments of outstanding compositionally strength: the beautifully succinct synchronised bass/guitar snaps and innocent, cagey interplay on Two Days is a Long Time Without You; Read's ponderous clipped adventure up the fingerboard for the ode to a chicken Burford Brown. Anecdotes – Volume II feels apt. We were presented with a mix of serious musical vignettes referencing classic sounds; and amiable gags about inadvertent strip clubs, laziness, and half-cut kebab-ing. And while the musical performance is very much a collaborative trio effort, these are primarily Read compositions, and Read's conversations with the audience - self-deprecating humour and faux-awkward comments. It was an album launch party to a home crowd, and the trio clearly revelled in it. But mixed in with their current tunes and old faithful old tracks were a handful of intriguing new pieces, too. The Matthew Read Trio may be launching Volume II, but it feels as if Volume III might already be on the way. On this evidence, I think next time they'll need a bigger venue!